Hilton Head Golf Island has over 30 golf courses spread about Hilton Head and Fripp Islands, as well as Bluffton, Beaufort and Jasper counties. An area that calls for golf enthusiasts to take in that Southern hospitality and get away from old man winter. Where else can you get such world-class public and private designs sculpted by vaunted architects Pete Dye, Jack Nicklaus and Robert Trent Jones. Hilton Head Goclf Island is ranked top 10 in seven categories by Golf Digest including “Best Buddies Trip Destination,” “Best Accommodations,” “Best Couples Trip,” “Best Courses,” “Best Food and Drink,” “Best Weather” and “Best Value.” Hilton Head Island also was named the International Association of Golf Tour Operators’ Golf Destination of the Year for North America for 2016. Home to the world-renowned Sea Pines Resort, the PGA TOUR makes its only South Carolina stop each April at Harbour Town Golf Links for the RBC Heritage Presented by Boeing. (HILTON HEAD, S.C.) – Hilton Head Golf Island (HHGI) – the International Association of Golf Tour Operators’ Golf Destination of the Year for North America for 2016 – unveils a wide selection of packages available this spring to suit any budget and golf group. Featuring world-class courses, exceptional value, pleasant weather and direct flights from major cities, Hilton Head Island is one of the most accessible golf destinations on the East Coast. GOLF Magazine recently named it one of the “Top 10 Most Dreamed About U.S. Golf Destinations” in its inaugural “Golfers’ Choice Awards, and Golf Digest ranked it in seven of eight top categories for golf destinations. The Inn & Club at Harbour Town Package – Perfect for couples, The Inn & Club at Harbour Town Golf Package begins at $375 (per person, per night) and features a stay at The Sea Pines Resort’s boutique hotel with daily breakfast for each guest. Overlooking famed Harbour Town Golf Links, the inn is the only Forbes Four-Star rated property on Hilton Head Island. Play on both Harbour Town and Heron Point is available. Afternoon replays on Heron Point (cart fee only) are offered subject to availability. Complimentary warm-up range balls, wireless Internet and use of The Sea Pines Fitness Center are included. The Heritage Golf Collection “Grand Slam” Golf Package – Starting at $175 per person per night (based on quad occupancy), the getaway includes four nights in villa accommodations and three rounds of golf at The Heritage Golf Collection courses (Port Royal, Shipyard, Palmetto Hall Plantation and Oyster Reef). Daily breakfast and lunch at the golf clubs are included, as are range balls and a Heritage Golf Collection VIP Discount Card. Valid through April 30, the Grand Slam includes all taxes and fees. Availability of accommodations and courses are subject to change, and some restrictions apply. 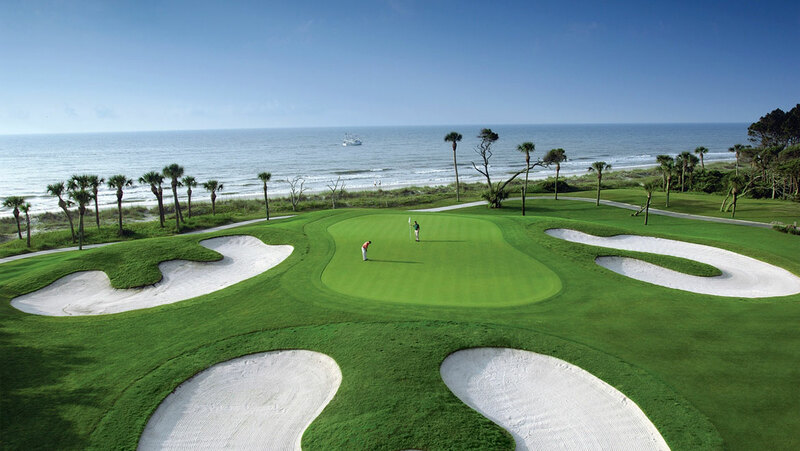 Palmetto Dunes “Birdies and Beer Getaway” – Guests enjoy four days/three nights in a two-bedroom villa at the Palmetto Dunes Oceanfront Resort, and three rounds of golf on the resort’s three championship courses: Robert Trent Jones Oceanfront, Arthur Hills and George Fazio. Starting at $180 per golfer/per night, the promotion features breakfast and beers via a resort gift card. Also offered: two hours of court time per day per villa at the Palmetto Dunes Tennis Center, range balls, dining and pro shop discounts, and preferred rates and priority access to all resort activities and amenities. JetBlue Airways is currently running special non-stop flights from Boston and New York City to Savannah / Hilton Head International Airport (SAV). Allegiant Air also flies non-stop into Savannah / Hilton Head from Indianapolis, Cincinnati, Baltimore, Pittsburgh and other cities. Fourteen other locales offer non-stop service to SAV including Chicago, Detroit, Dallas/Fort Worth, Houston, Philadelphia and Washington D.C.
For additional information about rates, restrictions and other package inclusions, or to receive a quote: www.hiltonheadgolfisland.com, 800.523.3373.